This program is designed to empower elementary, middle and high school students participating in the Dream in Green Academy’s environmental education programs by providing grants to support Green Team’s ‘green’ initiatives. 5th to 12th grade students learn to brainstorm ideas, manage budgets, work as a team, and execute projects that have a long-lasting impact on the environment. to develop long-term behavioral changes and community sustainability. Monthly Challenge Grants (from October to March): Elementary schools will be awarded grants of $350 and middle/high schools will receive grants of $400. Grants are to be used to support a green initiative that aligns with one of DIG’s monthly themes. Monthly themes include energy efficiency, water quality & conservation, waste reduction & recycling, alternative transportation, ‘green’ living and food efficiency. We also encourage schools to create their own projects in relation to the environmental topic of the month. Eco-Summit Grants (April): Grants will support Eco-Summits that showcase students’ ‘green’ projects to the wider school and community. For more information about how to create an Eco-Summit, please refer to the 2018-2019 Academy Guidebook. This funding is made possible by the Batchelor Foundation, Inc.
Schools must be enrolled in the Green Schools Challenge. A school may be awarded only one monthly challenge/Eco-Summit grant during the program cycle. 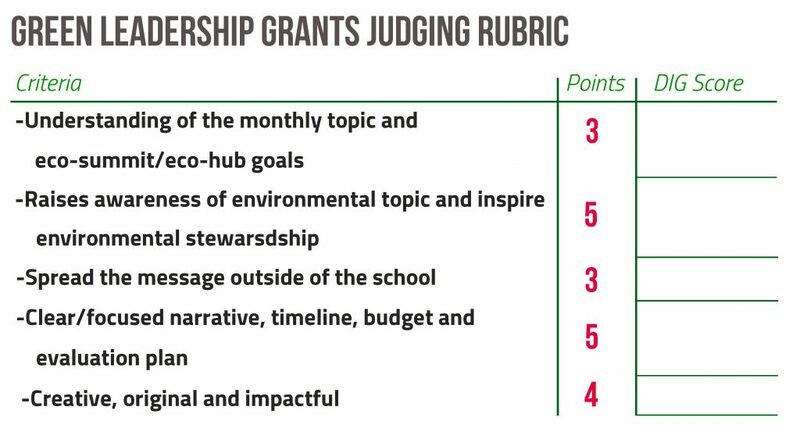 Submit the grant proposal form(s) found on the links below to tell us about the green project the Green Team would like to develop and implement at school. Your proposal should be concise and realistic, and must include a narrative, project timeline, budget and evaluation plan. Please keep to the word count suggested for each section. The monthly challenge proposal form is now fillable! Dream in Green staff want to know about the project you created! Awardees of the monthly challenge/eco-summit grants will have 30 days to complete the project and 45 days to provide the required documentation, including pictures, project completion evaluation report and survey. Contact Sophia at alexandra@dreamingreen.org for more information.